We host a Halloween Party every year, and one of the things I really enjoy doing is making the invitations. 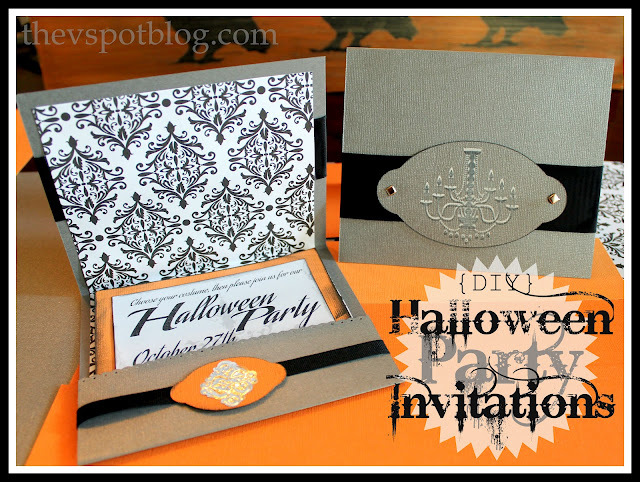 (Here are the invitations I made last year. Super easy.) While I did do a “Save the Date” over Facebook at the beginning of the month, I think there’s just something special about getting an actual invitation in the mail. Even if it’s just one item in a the middle of a dozen bills and junk mail pieces, at least it’s a fun item, right? I am not a scrap-booker, or a particularly talented paper crafts person. However, I can measure, I can cut a straight line, and I have double sided tape and ribbons. I am good to go, and so are you. Here are the supplies needed for basic construction. Makes 20 invitations. To dress it up a bit, you can use whatever you like and do whatever you want. Start by cutting all of your gray cardstock in half. You should have 20 pieces, measuring 6 x 12. Next, (if you’re using ribbon on the front of the invitation) cut a length of ribbon that is about 7″ long. I cut a patterned edge at the bottom of the card. 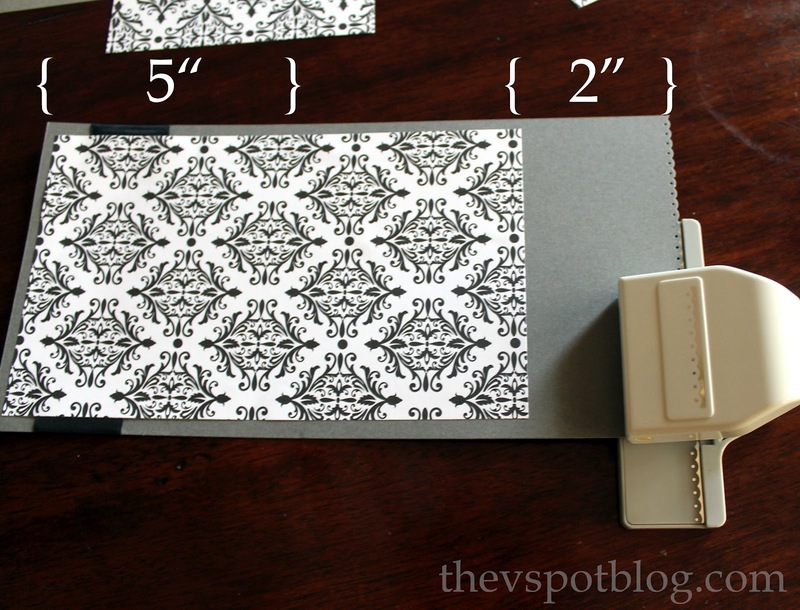 If you don’t want to, that’s OK, or if you don’t have a decorative paper punch you can use decorative edged scissors. Whatever you want. This is also the point where you are going to fold the card. From the top, measure 5″ down and create a fold. Then fold the bottom 2″ (with the decorative edge) up. Make sure you make a nice, crisp crease. 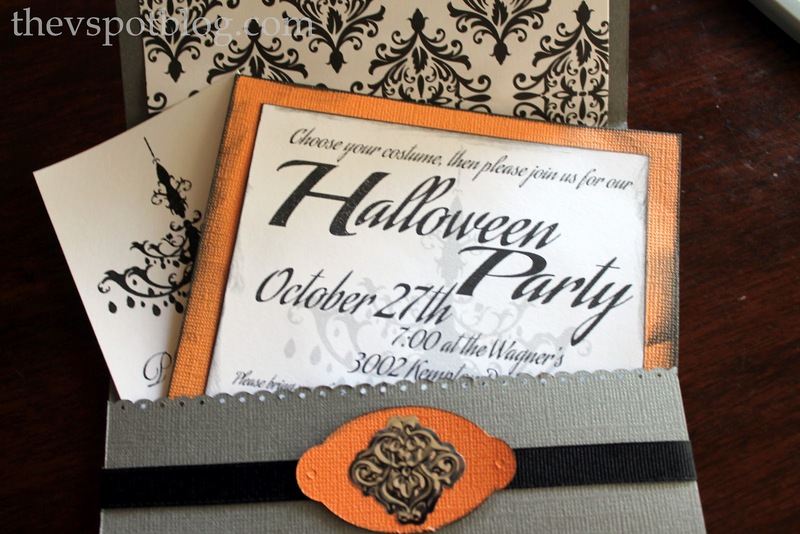 To create the “pocket” for the invitation, you’re just going to tape a ribbon around it. Start with double stick tape right in the middle. Cut a length of ribbon that’s about 12″ long. Place one end of the ribbon on the tape, wrap it around the back of the card and adhere the other end to the front. Add a piece of regular tape over the top to make sure it’s nice and secure. 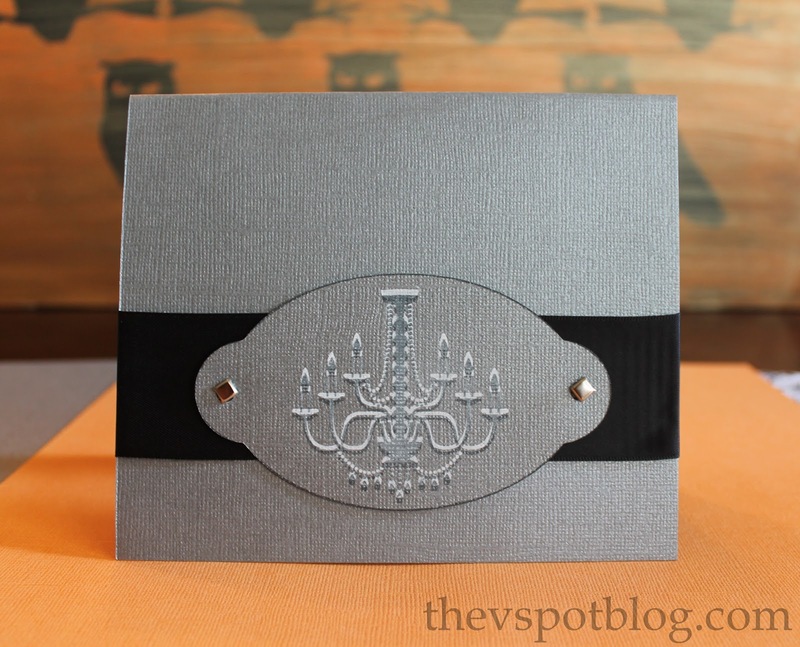 Add your little embellishment over it to hide the seam, then put your invitation (and RSVP card) into the pocket. The front shape was stamped with chandelier shaped stamp, first with a white ink, then black ink slightly off-set right over it. I put brads through the holes on the front, and didn’t worry about the tiny holes on the smaller shape inside. As far as the actual invitation inside, the orange cardstock was cut into 5 1/4 x 4 3/4 inch pieces. I printed the information on white cardstock and then cut it out so that it was slightly smaller than the orange piece. I distressed the edges of both pieces with black ink from the inkpad, then I used the glue stick to adhere the white invitation to the orange piece. Done. By the way, don’t be like me and forget to put any RSVP or contact info on the invitation. If that happens, you are going to have to print up a separate piece and tuck that into the pocket too and pretend that you meant to do it that way. Those are just gorgeous! Love the chandy, reminds my of the Haunted Mansion. I’m sure your party will be fabulous!! Just from how you describe your Hallowe’en personality type (and yeah, I totally think that should be an online multiple choice test!!) I’d LOVE to party with you on October 31st! Nailed it… chandeliers, top hats, Nevermore and creaky floor boards. That’s all I need! Love your cards, they are classy and elegant. One of my future purchases (after the sudden, unexpected windfall that I just know must happen one day) is a full kit of scrapbooking materials. I love digiscrapping, but something to stick into an envelope and mail to loved ones via snail mail would be fantastic!